Well, you win some, you lose some. I know that all of you are extremely broken up about the fact that Stanford failed to cover the spread on Sunday afternoon, but I promise that I’ll be better today. There was this other big sporting event going on that night, and I was distracted watching videos of Gladys Knight singing the national anthem from 1992 with a stopwatch in my hand. Don’t worry about it – just doing my research. Tonight, we get a reasonably straight forward SEC match-up as the Missouri Tigers march into Tennessee to take on the #1 ranked Volunteers. Mizzou strumbled out of the gate and got blown off of the floor by Auburn before picking up the pieces and taking down Vanderbilt at home. Meanwhile, Tennessee broke a school record for consecutive victories that had stood for over 100 years by thumping the Aggies by 17 on the road. Tonight, the home orange are currently favored by 17 points with the total set to a nice and easy 142. Let’s rock the casbah. Tony the Tiger couldn’t even save this Missouri team. However, it’s not really their fault. Sophomore phenom Jontay Porter suffered a torn ACL before the season, and standout guard Mark Smith has been sidelined with an ankle injury. With coach Cuanzo Martin running the show, Mizzou is destined for a lifetime of unspectacular relevance. But not everything is bleak; Porter will presumably return for another year in the fall, and he’s not so subtly (in my eyes) a much, much more complete player than his overrated brother. Hang in there, Tigers. It’s a long, arduous journey to a victory against Tennessee, but Mizzou can do it if they limit their turnovers. In their first meeting, the Tigers coughed the ball up 15 times, and Tennessee was able to pad their stats with easy transition buckets en route to a blowout victory. But the Tigers have been able to limit their turnovers of late, and with senior guard Jordan Geist running the show on offense, they should be in capable hands. Now all they have to do is stop two of the ten best players in college basketball. No biggie. With all due respect to Mr. Schofield, there’s only one Admiral in basketball lore, and that title belongs to Mr. Robinson. 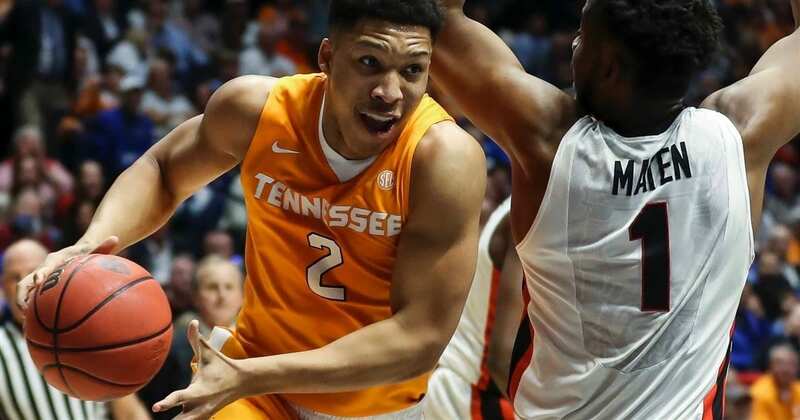 But Tennessee’s Admiral and their other stud Grant Williams combine to be the best player in college basketball, and their record reflects it. If it weren’t for those Devils down in North Carolina wreaking all kinds of havoc, all of the attention would be on this dynamic duo. But in a way, this has helped Tennessee to have the drive to prove the haters wrong, and I’m here for it. Really wishing I had listened to my gut and bet them preseason to win the championship. Hindsight is 20/20. It’s bad enough to have to stop these two freaks, but now that Jordan Bone has found his shooting stroke, Tennessee is running away with the SEC. Tennessee already set a school record for consecutive wins, but they aren’t done yet, and they would be wise to keep the pedal to the metal as the season draws to a close. With upcoming games versus Florida and Kentucky, the only real concern here is whether or not Tennessee is going to bring their “A” game. If they do, this one is signed, sealed and delivered. I’m yours. When it’s a Tuesday night in the middle of college basketball season, it’s best not to overcomplicate things. Tennessee has averaged 20 points per game more than Missouri and double up their assists per contest. Tennessee has cruised to an 8-0 start in SEC play, and there’s no reason to doubt them now. As long as there is no freak injury to Schofield or Williams between now and approximately 11:15 pm ET, I feel pretty confident in the Volunteers ability to put this one away early. I’m sorry, Mizzou. Maybe next year.